Featured components and capabilities described below. Runs in your web browser. IE, Chrome, Firefox and Safari supported. No Java or Flash Required. No separate programs to install. No incompatibility problems. Secure. Control layouts using the quick access launcher in the lower left. 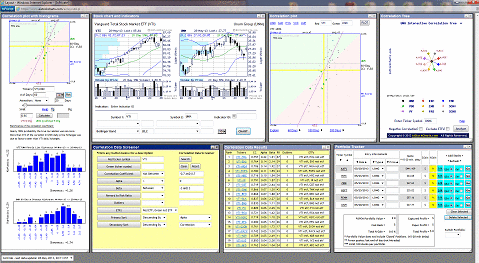 Move, close, minimize, resize and save the various windows, positions and contents including any charts, database searches or portfolio views you set. Plot the daily percentage changes in price of any 2 stocks or currencies tracked in our database. Hover over any data point on the plot to display the date and percentage changes associated with the data point. 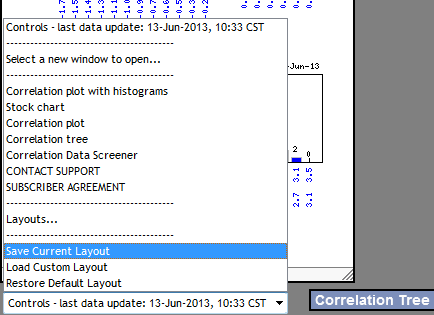 Select a custom end date for the correlation plot from the calendar. Calculate the historical predicated change in price of the green ticker based on the red ticker and the best-fit purple line. Show the significance of the correlation coefficient. Histogram of the distances of each data point to the purple best-fit line. Includes Skewness and Kurtosis. Histogram of the daily percentage changes for each of the green ticker data points. Includes Skewness and Kurtosis. Plot the percentage change in daily stock prices of 2 stocks. Quickly access correlation plots of common securities such as gold (GLD), high yield corporate bonds (HYG), S&P 500 VIX short term futures (VXX) and the US Dollar (UUP). 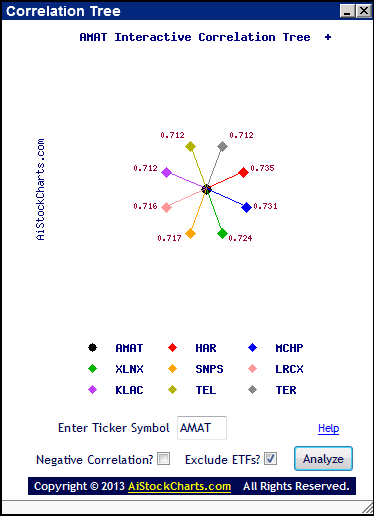 Graphically show the most correlated or anti-correlated stocks to another stock. Specify positive or negative correlation. 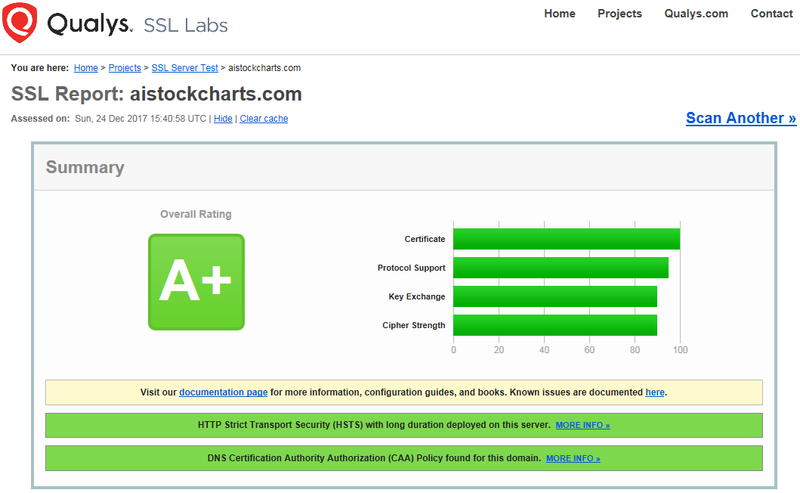 Hover over the data point to show the name of the company or security. Click the data point to traverse through the correlation tree. 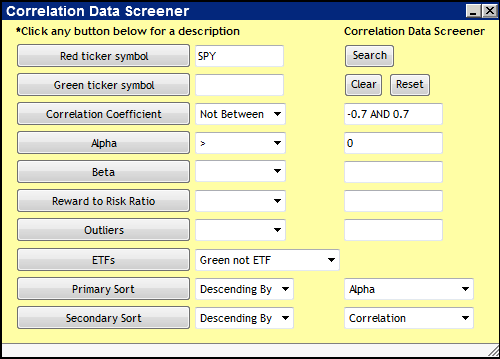 Search and sort by ticker, correlation coefficient, alpha, beta, reward to risk ratio, outliers and by etf or non-etf. Click any of the field buttons for a description. Your default search is saved when you save your custom layout. 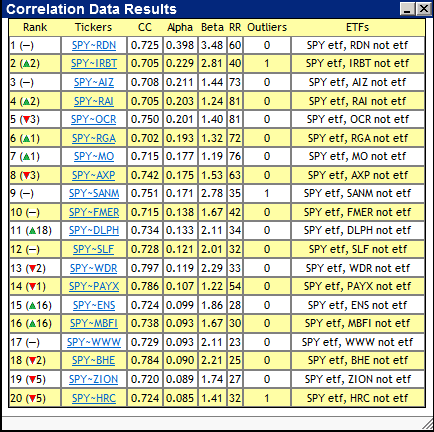 Shows the results of your search from the correlation data screener. Also serves as a general help screen. Rank is the current rank based on your search criteria. The change in rank from the prior day is shown with a dot if your search criteria was not met the prior day. 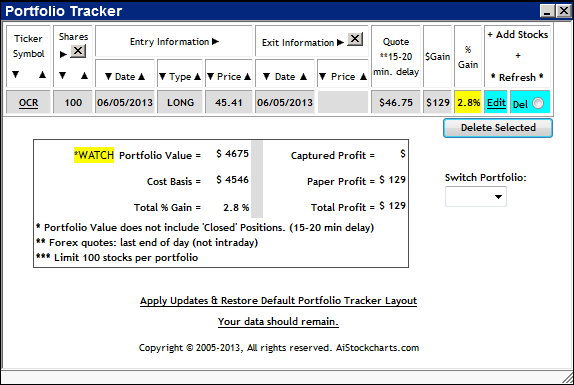 Track up to 100 stocks per portfolio. Enter as much information as you want (only the ticker symbol is required). Field available for commission tracking. On May 10, 2013 Federal Reserve Chairman Ben Bernanke spoke at the 49th Annual Conference on Bank Structure and Competition sponsored by the Federal Reserve Bank of Chicago. 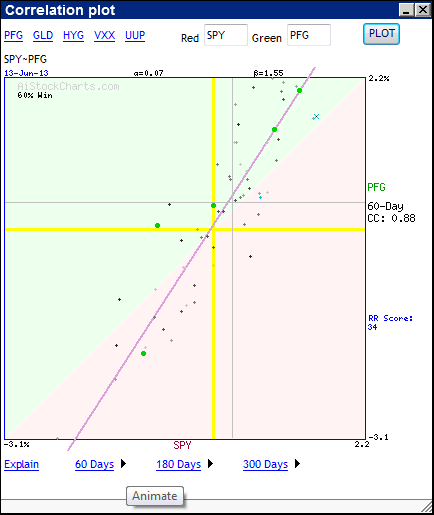 THE FED USES CORRELATION ANALYSIS! See Mr. Bernanke's remarks below regarding the monitoring of the financial system. 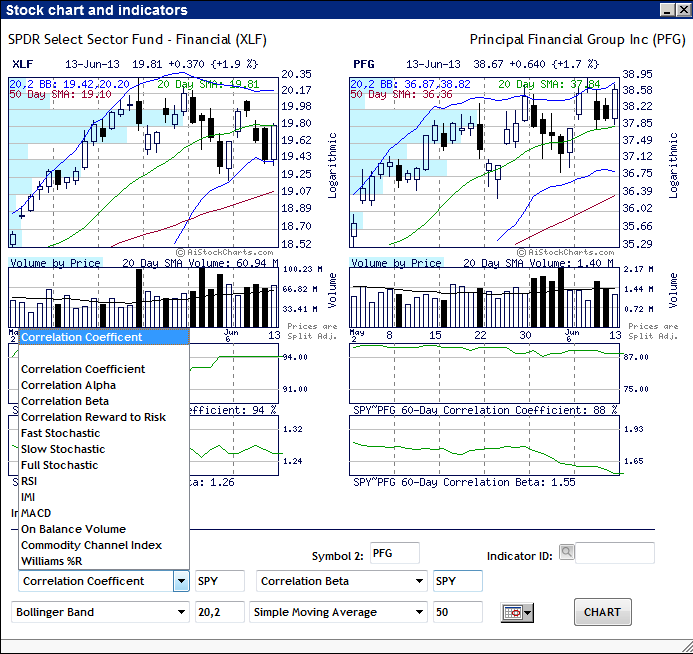 Signup for a subscription to the AiStockCharts.com Correlation Trading Platform.